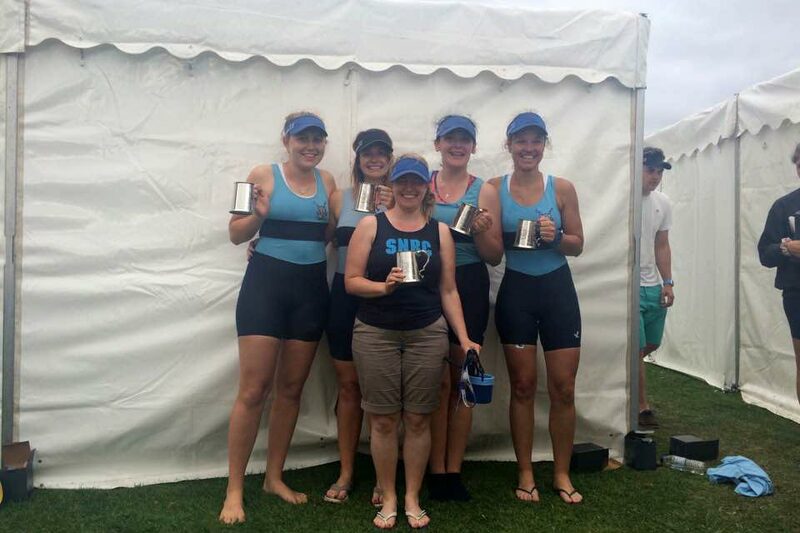 Winning W.Nov.4+ crew (left to right): Hannah Towns, Dominie Clarke, Tammy Finnigan (cox), Tash Holdaway and Jaione Echeveste. St Neots Rowing Club is celebrating one of its best regattas ever after many of its members achieved debut victories. Arguably the best performance came from Hannah Towns, who lost her novice status for both sculling and sweep-oar rowing within the space of two hours. First she joined forces with Izzie Pigg to win the women’s junior 16 double category, with both girls losing their sculling novice status. Then she won again less than two hours later in a women’s four, this time losing her sweep-oar novice status alongside Dominie Clarke, Jaione Echeveste and Tash Holdaway, all coxed by Tammy Finnigan. Tim Neill and Dave Bygraves also waved goodbye to their sculling novice status after winning the Masters BCD double category. Other St Neots wins included a mixed eight, a composite men’s four that included two members from Bedford Star Rowing Club, and a men’s quad that produced one of the weekend’s tightest finishes, beating their Norwich opposition by just a few feet. More than a thousand rowers competed over both days, at what is one of the biggest and most popular regattas in the UK. Many of Britain’s leading clubs sent large numbers of competitors, with Norwich, Maidstone Invicta and Broxbourne in particular all achieving lots of wins. “What a fantastic two days it has been,” said Mick Staddon, vice chairman of St Neots Rowing Club. “The sun shone, the rowing was first class and we probably had our largest ever crowd of onlookers, many of whom stayed on to enjoy the beer tent and live music on the Saturday evening. “Huge thanks must go to all our members at St Neots; it’s only through their hard work that the regatta is so popular and takes place each year.